(TibetanReview.net, Mar11’16) – Kasur Dicki Chhoyang who resigned from her post as the minister for Information and International Relations in the cabinet of Sikyong Lobsang Sangay on Feb 28 in order to be able to speak freely on the upcoming Sikyong election has said Mar 8 that she will vote for Speaker Penpa Tsering of the Tibetan Parliament in Exile as the next Sikyong. 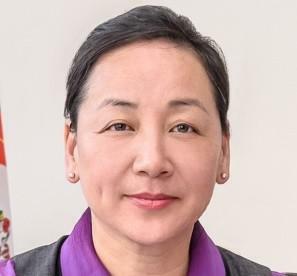 On Mar 6, Chhoyang had issued a statement, listing nine points on which she believed the eligibility of a candidate for being elected as the next Sikyong should be decided by the voters. In it she called for a Sikyong of integrity and true ability, and a team player without any parochial bias. She is disappointed that the ongoing debates were not up to the mark and limited to trivial issues. “There are people who are voting on the basis of regional affiliation. That’s sad. We should be teaching our children that we are Tibetans first. Playing on regional sentiments will not make our democracy meaningful,” she has said. She is also disappointed, calling it pathetic, that some people were voting on the basis only of look and personality. And she felt that there should be more debate about improving the situation of Tibetans in Tibet and resolving the Tibetan issue.